Just Us and Big Bad Voodoo Daddy at The Canyon in Montclair! April 20, 2019, Doors Open at 6:00pm. Click on the link below to purchase your tickets. Click on Eventbrite get your tickets NOW! JUST US is a lively, entertaining, professional vocal group with beautiful 4-part harmonies. 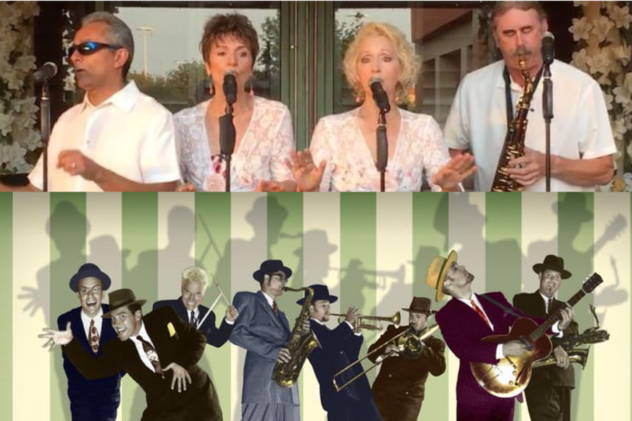 Our wide repertoire includes Jazz, Broadway and Swing, with a sprinkling of pop classics. You can enjoy numbers by Duke Ellington, Glenn Miller, Fats Waller, Manhattan Transfer and so much more. JUST US performs all over the Los Angeles area, at venues such as Terranea Resort, Trump Golf Club, Beverly Hills Food and Wine Festival, LA Convention Center, 94th Aero Squadron, South Bay Festival Of Arts, Zelda’s, Bon Vivant, as well as other wineries, festivals and corporate events. Each member of the group has an extensive background in entertainment, ranging from National tours for Columbia Artists, performing in theater productions, television, radio, recording, and also performing for the US troops in Europe, as well as other European venues. Based in sunny Southern California, the group began as an idea of gathering together a few veteran singers/performers who wanted to create a unique experience for an audience to enjoy. They have succeeded in uniting their individual skills and artistry to blend into the magic that is ‘”JUST US” – delighting those who appreciate good music, great fun and a touch of nostalgia! Members of the group are: Barbara Gilliam; Brian Ingalls; Janette La Bella and Paul La Bella.